One of the advantages for businesses operating in the digital space is the sheer amount of data available, from search data to help you identify the types of keywords your target market is using or the topics and news your users are sharing on social media. While you can collect this type of data from third parties, there is also a wealth of data that you can collect yourselves. With the advent of Google Tag Manager (GTM), this is no longer the case. This is an incredibly simple platform to set up on your site and from the admin interface you can track a significant amount of on-site user actions. For example, you can track all clicks on external links, mailto: links and clicks on downloadable files such as PDFs. You can even get as granular as to track the number of times visitors play, pause and watch your YouTube video embeds to the end. Once the Google Tag Manager script is setup on your site you will very rarely, if ever, have to change the code on your site to set up tracking. Firstly, if you don’t have a Google Analytics account set up you’ll need to sign up for that (it’s free). It’s fairly straightforward so I won’t guide you through that. Once that is set up, visit Google Tag Manager. In Google Tag Manager, you will need to create an account before you do anything else. If this is the first time you are using GTM, then you should already be presented with an Add a New Account screen. Once you have created you Google Tag Manager account, you will be presented with a snippet of code. Installing Google Tag Manager into a WordPress theme is really easy. You can use a plugin; however, I still think it is best to paste the code snippet into your theme. Please note that if you are using a theme created by somebody else, then it is recommended to create a child theme to make edits such as this. If you don’t, then you risk losing any changes you have made if the theme gets updated. The code above is an example of a Google Tag Manager snippet. Replace GTM-XXXXXX with your tracking ID. Easy done! You now have Google Tag Manager Installed on your WordPress site. The Google Tag Manager interface can be a little confusing if you haven’t used it before. Here is a breakdown of each of the sections. The accounts interface in Google Tags Manager. This is where you just set up your account and container. Here you can add more accounts if you manage multiple websites and you can also create new containers. For example, if you also have a mobile app. Check out your Google tag activity. This is where all of the fun stuff happens. Here you can see a dashboard with an overview of your tag manager activity and you can also navigate to tags, triggers, variables and folders. Tracking tags in Google Tag Manager. These are snippets of code that execute on a page, often to send data to a third party application like Google Analytics. Generally, tags will fire when a page loads, however, this can be changed within each tag’s settings. Setting triggers with Google Tag Manager. These are conditions that are either true or false depending on how variables compare with values you set when defining the trigger. Triggers are then used to fire tags. Setting variables in Google Tag Manager. Variables can be virtually any value and some are predefined. For example, the “url” variable always contains the URL of the page that is currently loaded. Managing your folders in Google Tag Manager. These are simply a way for you to organise your tags, triggers and variables. You can create whichever folders you like and organise them how you see fit. Keep an eye on which versions you’re using. For those that have used any service like Git, this is essentially GTM’s version control. Imagine you make some changes to Google Tag Manager and you end up breaking something, but you aren’t sure what. Here you can re-publish one of the prior, working versions of GTM. The admin screen, as you would expect. This section is what you would expect it to be. Here you can manage which users have access to your account, import containers, export containers as well as find your Google Tag Manager code snippet. Your changes will go live when you hit the “Publish” button. One of the most important parts of the interface. None of the changes you make to your tags will be live until you press the “Publish” button. Now you know what each of the interface elements are, let’s set up Google Tag Manager so Google Analytics will track visits to your site. Event tracking in GA is a really useful feature for tracking user actions on your site. It can provide insights that will help you to make UX, UI and marketing decisions. You can track all manner of events, including external link clicks, video play button clicks and form submissions. Events are made up of four fields: eventCategory, eventAction, eventLabel and eventValue. The first three fields are text and the eventValue field is an integer. Let’s get into our first event to track. 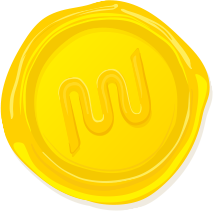 We’ll track clicks on all email links, i.e. all links that contain “mailto:” within the “href” attribute. Why would we want to track email clicks? Well, we can’t be certain an email is actually sent, but we can at least track which users have made an intention to send an email. That’s it! It seems like a lot of steps but it’s actually really quick. Quick tip: You can track telephone number clicks the same way. Simply set up a new trigger for clicks on links that contain tel: and then create a tag to track the event in Google Analytics. We can track whether people are clicking on mailto: or tel: links, but what if we want to know whether people are clicking on a banner or whether they are clicking on a text link within an article? We can do that really easy within WordPress, GA and GTM. There are actually a number of ways that we can set this up, but a really easy way is to make use of either class or id attributes. Before we set up anything in GTM, we need to make sure that the link we want to track either has a unique ID attribute or if it is multiple links of the same type, e.g. all footer links, then they should all have a class that is specific to them as a group (recommended) or each one would require a unique ID. Depending on how your theme is built will determine the next step. If you can edit the links you want to track with the WordPress text editor, then it is an easy process to add an id attribute or class to your links. If you can’t edit the link in the WordPress text editor then you may need to edit your actual template files to add the id or class attributes. Remember to create a child theme when editing your theme template files. Creating a variable for internal link clicks. Creating a trigger for internal link clicks. Finally, creating a tag for internal link clicks. Easy. We now have events being fired whenever our specified banner is being clicked. Quick tip: Click events can be tracked on any element, not just links. When choosing the options for Configure Trigger, select All Elements instead of Just Links. What if we want to track all clicks on external links? Well, this requires a slightly different approach as we will need to create a new variable, but it’s still very simple to set up. Tracking external links needs to be set up slightly differently. And – you guessed it – you next to create a tag, too. Easy. Google Analytics will now track every time someone clicks on an external link as an event. Tracking embedded YouTube events can provide useful information regarding which videos are actually engaging your visitors. Setting up YouTube embed event tracking is a little more complex than any of the GTM examples so far, but luckily there is a great repository on GitHub which solves many of our problems. There are actually two ways to get event tracking working with YouTube video embeds using this repo. We will set this up using the more manual approach so that we can understand each of the steps involved. If you would like to use the other method, which involves importing a container into GTM, then please follow the guidelines in this repository’s readme. 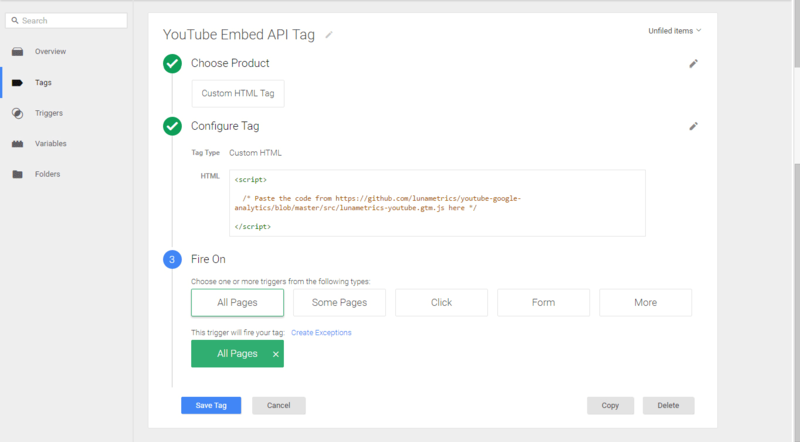 Creating a custom YouTube embed API tag. Creating a YouTube video event trigger. Creating a YouTube embed event tag. That’s it! Publish your changes and then go to any page on your website that has a YouTube video embed. Play the video, pause and watch it to the end, then check your Google Analytics Real-Time events and you should see those events being recorded straight away. Did you know that you can track virtual pageviews with GA? What are virtual pageviews? 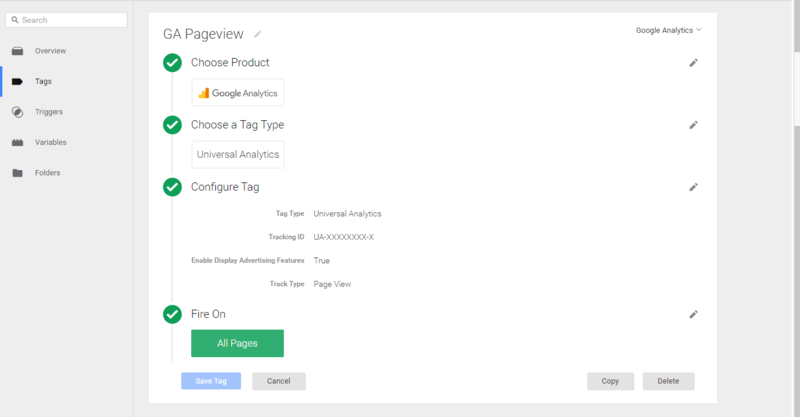 Well, the “standard” GA pageview is generally triggered when a web page initially loads; however, it is possible to create a virtual pageview in Google Analytics. This is tracked in GA as a pageview and you can set the URL path as whatever you would like. You may be wondering why you would want to create virtual pageviews. Imagine you have a single page application (SPA) and a lot of the content is loaded dynamically via AJAX, then you are unlikely to be able to track this with a standard GA pageview. Virtual pageviews could be used to track AJAX content generation in this instance. Virtual pageviews are also great for tracking GA goals that are set up for destination URLs. It is possible to set up GA goals for events, but you cannot set up funnels for them. Funnels can only be used with destination goals and sometimes a goal may not result in the visitor loading a new page. A great example would be PDF files that visitors can download. In this instance you would have to set up virtual pageviews to track this download as a goal if you wanted to use a funnel. Let’s take a look at how we would set that up. Creating a click URL path variable. Creating a PDF download trigger. Finally, creating a PDF download tag. Publish your changes and you’re finished. If you click on any links to PDF files on your site, then these will trigger virtual page views that you can use to set up GA goals with funnels. Google Tag Manager is a fantastic tool for tracking user actions on your site. Hopefully, this post has made it clear just how easy it is to collect a variety of data without needing much development, if any. Do you use Google Tag Manager? If so, share your examples in the comments below. Hi Jo! Yes, Google Tag Manager actually allows you to get quite granular, even out of the box without much customisation. If you start digging into data layers and GTM then you can do even more. It’s really good because you don’t need to keep adding new code to the website like you do with GA and custom events. We use this and once the GTM code is added our SEO team is in complete control of tracking. For non-developers, GTM is the best because it gives you a great UI and you don’t have to mess with random snippets or hacking code or bugging developers. Hi, could you please explain how we can track visitors and logged-in users with the new User-ID feature of Google Analytics and tag manager ? that’s great ! also please mention in the tutorial how to exclude wordpress admin traffic ! Looking forward for it :) How will I know when this is published ? I was able to implement a weather/location tracking tag which wowed the office. Basically, it takes two open APIs for location and weather and records them as events. This way we can see what business is generated during different climates (snow vs clear, hot vs cold). Not fully useful for our company, but interesting nonetheless. Also, per Joey… it appears that the GTM interface screenshotted here is an older version (?). Mine is much different as well. More streamlined. But you can still do what is being shown (in an easier way). Before asking my question, I have to admit this article is excellent and very, I mean very helpful. Now onto the question that regards the Download Tracking in G.T.M.. Many sites do not have the option of directly downloading the file but rather when you click on the file your browser opens a new tab with the preview of the file. From there, using the dropdown menu you can download it, meaning a click on the link of the file won’t necessarily mean a download ( it might be just a pageview ). Now how can I track the downloads in this kind of situation ? There are a couple of things you could do to force downloads, rather than allowing people to view files in the browser. The simplest solution would be to add a download attribute to the anchor element. It isn’t supported in all browsers, but it is in most. You can see the browser support for this here http://caniuse.com/#feat=download. You can also edit your .htaccess file to always force specific file types to download http://www.inmotionhosting.com/support/website/htaccess/force-download-htaccess. Please make sure to test any changes thoroughly to ensure they are working as expected. Especially if you are making changes to the .htaccess file.